KITSAF4133SLUNV10200 - Value Kit - Safco Luxe Magazine Rack (SAF4133SL) and Universal Small Binder Clips (UNV10200) by Safco at MDA-MA. MPN: SAF4133SLUNV10200. Hurry! Limited time offer. Offer valid only while supplies last. lt;stronggt;SAF4133SLlt;/stronggt;lt;BR/gt;Safco Luxe Magazine Racklt;BR/gt;An upscale display with a sleek silver-coated, brushed aluminum frame. lt;stronggt;SAF4133SLlt;/stronggt;lt;BR/gt;Safco Luxe Magazine Racklt;BR/gt;An upscale display with a sleek silver-coated, brushed aluminum frame. Clear acrylic pockets offer optimum visibility of contents. 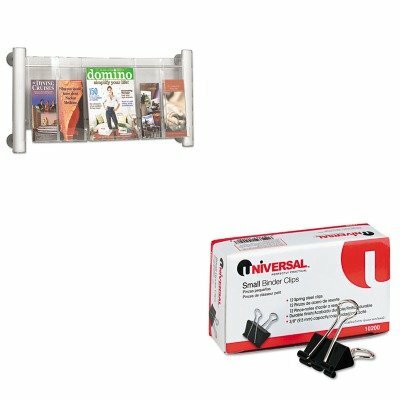 Wall-mounted and floor-standing racks have center dividers that allow for pockets to be sized for magazines or pamphlets. Color: Clear Silver Overall Width: 31 3/4amp;quot; Overall Depth: 5amp;quot;.lt;BR/gt;lt;BR/gt;lt;stronggt;UNV10200lt;/stronggt;lt;BR/gt;Safco Luxe Magazine Racklt;BR/gt;Ultra-efficient binder clips feature handles that can be hung, folded flat against clipped material or removed for permanent binding. Efficient triangular design provides optimum strength and compression. Clip/Clamp Type: Binder Clips Colors: BlackSilver Materials: Plastic ClipSteel Wire.